Last year we carved a Jake & The Never Land Pirates pumpkin with a template from the Disney Junior Canada site and this year we wanted to try something a little different. We love Doc McStuffins and the rest of the crew so it seemed like the perfect choice! 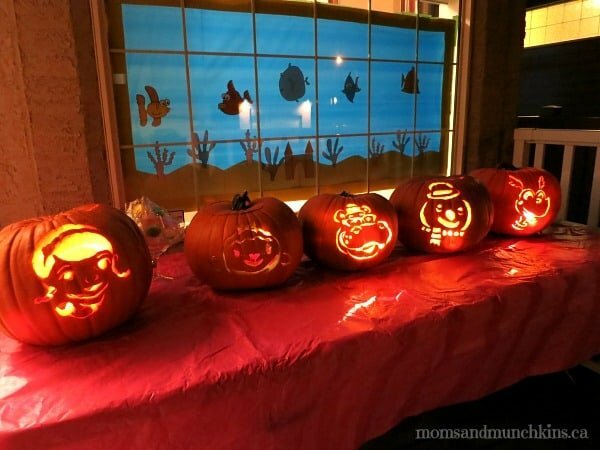 Could we handle carving five pumpkins? I thought so! 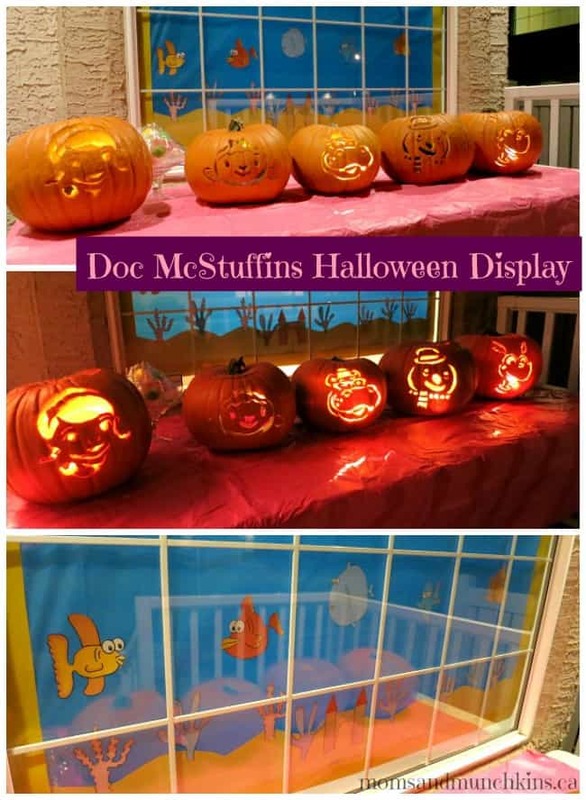 Here’s how we created our Doc McStuffins Pumpkin Halloween display. If you love Doc McStuffins, don’t forget to check out our special Doc McStuffins category for even more fun ideas! If you’ve watched Doc McStuffins you’ll know that she has a pink desk and a large fish aquarium in the entrance to her office. I wanted to recreate that area in our Halloween display. 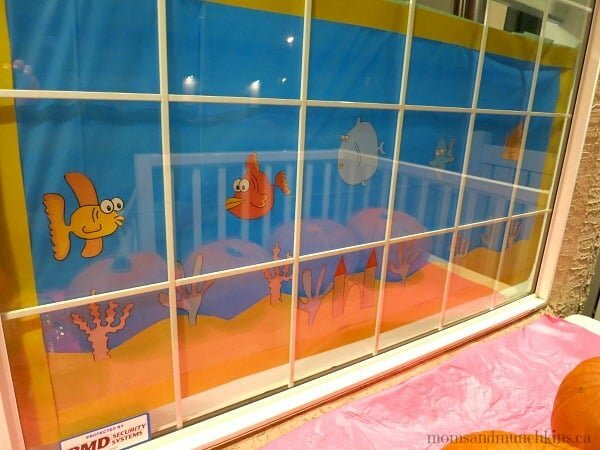 To create the fish aquarium, I simply cut out long strips of yellow poster board to create a rectangle, taped a blue plastic tablecloth in the middle for the water, used light yellow construction paper for the sand at the bottom of the tank and I cut out cute fish clip art that I purchased on Etsy. All of those supplies were less than $10. We then used painters tape to tape it to the inside of our front window. 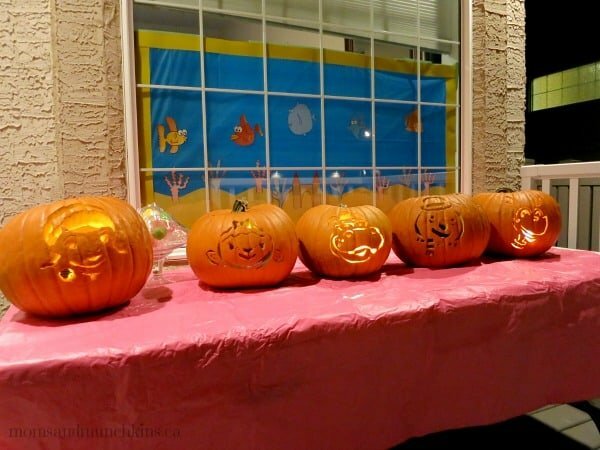 For the Doc McStuffins pumpkin templates, I used the free templates on the Disney Junior Canada website. As I’m sure you can imagine, carving five pumpkins was not a quick task! I recruited the help of my mom and husband for scooping and carving duties. My mom is going in for eye surgery tomorrow so I had to recruit her to help tonight. Perfect timing, right?! Even my little guy (2 years old) was helping to scoop out the pumpkins. He was so adorable doing it though because he’d take a big scoop of pumpkin and then dump it into a pumpkin I had already cleaned out. Ha! Such a good little helper! We then put a flashlight in each pumpkin and displayed them on a pink tablecloth on our front porch. Now I just hope they last us until Halloween! Notice the lollipops on the table for all the good patients? Have you already carved your Halloween pumpkin? If so, what did you make? Let us know in the comments below. Disclosure: I am part of the Disney Junior Mom program and I receive special perks as part of my affiliation with this group. The opinions on this blog are my own. Hi! I’ve sent you an email.